Legal Expert has successfully negotiated many slip trip claim against the council cases. In this instance, the claimant was walking along the pavement in a public place. The pavement and area were maintained by the council. The claimant’s foot was caught in a pothole whilst walking down the street. As a result, they fell over and landed on their right shoulder and knee. They sustained a variety of injuries to this area, the most serious of which required keyhole surgery. After negotiation between the two parties, a settlement of £11,000 was agreed for both damages and compensation. 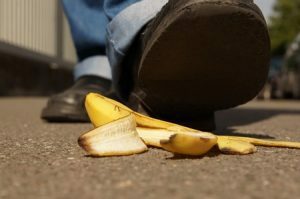 Slip Trip Claim Against The Council – How Common Are They? Whether in the workplace or out on the street slip, trip and fall accidents are one of the most types of accident in the UK. According to the Health and Safety Executive, slip trip claim injuries accounted for 29% of all workplace injuries. Finding out how many people have made a pavement trip compensation against the council each year is difficult. Cases are not always listed and could have been settled out of court. It is also difficult to get an accurate number for how many people have suffered a slip, trip or fall on the street each year. Not all accidents are recorded, and not all cause an injury. However, it is known that councils across have paid out millions of pounds per year to people who have been injured and have made pavement trip compensation claims. In order to be able to successfully make council compensation claims following a slip, trip or fall, you need to demonstrate that the accident was caused by negligence on the part of the council. In this slip trip claim against a council, the claimant cited the duty of care imposed on the council under section 41 of the Highways Act of 1980. The claimant went on to state that the council responsible for this section of street and pavement had not instituted the required or necessary system of inspections. These should have been carried out on the pavement and the road. As such, they had allowed the pavement and road to fall into a state of disrepair which was dangerous to pedestrians. The trip or fall compensation case went on to state that the local authority had failed to warn pedestrians of the defect in the pavement and the danger which is possessed. They also alleged that the council had failed in taking reasonable care to ensure that pedestrians walking along the pavement would be safe enough. The allegation in this trip or fall compensation case stated that due to this failure in their duty of care under the relevant legislation, the claimant had been injured and that this injury had lead to both long-term physical and even psychological injuries and suffering. If the pavement or street a pedestrian is walking down when an accident or injury occurs, the council may not be responsible. Liability may rest with the private company who owns or maintains the pavement. A Personal Injury solicitor will be able to help you with establishing who is responsible. What Injuries Were Sustained In This Case Study? The claimant was walking down the street in an area of Hampshire when they caught their foot in a pothole which should have been repaired. The pavement had clearly not been maintained to the correct standards. The claimant caught their foot in this pothole causing them to fall over. This resulted in injuries to the right shoulder and knee. These injuries would take several months to treat and require numerous visits to the local hospital. The victim attended their GP surgery and was referred for treatment at their local hospital. They sustained a serious ankle injury which necessitated keyhole surgery in the patient’s right foot tendons and ligaments. Following this, they were fitted with a cast as advises recover could take up to 12 months. After five months the claimant was still under treatment from their local hospital and they still suffered the impact of their slip trip claim. At this point, the claimants’ physiotherapist stated that in order to best recover from the accident, they needed to have an operation to fuse their bone or an x-ray guided injection into their ankle. As well as suffering the initial injury, they also suffered long-term injuries and complications. Following these injections, the claimant still had pain in their ankle and found walking difficult. The consultant found that this pain was accelerated by the accident and noted it had also caused anxiety. What Did The Claimant Claim For? Slip and fall compensation amounts can vary due to the nature and severity of the injuries sustained. As well as general damages, a fall compensation calculator will take into account what is called special damages. These include other out-of-pocket expenses, such as travel costs to medical appointments or alterations to the home. Once the letter detailing the slip trip claim was sent to the council, they acknowledged receipt of the letter and began an investigation into the accident and the injury. After a three month period, the council had not replied to the letter. The solicitors sent a further letter informing the council that if they did not reply in 14 days, it would be assumed that they admitted liability. The council then denied liability stating that under the relevant legislation the highways agency was responsible for the area the accident happened. They also noted that they carried the required four inspections per year and that in the previous drive-by inspection the defect was not visible. They also supplied records of this. Supporting evidence was sent by the claimants’ solicitors and they demonstrated that a pothole of this size would not have opened in the relatively short time (9 weeks) between the previous inspection and the accident. Eventually, the claim was disclosed in full to the council. A council compensation payout of £9,000 was offered. Though advised to take the offer the claimant declined it and sent a counter offer of £15,000. Following a series of negotiations between the two parties, a compensation settlement of £11,000 was agreed by both parties. Pedestrians can be injured in a variety of ways. As well as falling over due to defective pavements, pedestrians can also be injured due to themselves, other pedestrians and even road users disobeying traffic signs and signals. Other common causes of these accidents can include failing to follow the correct process when crossing the road and disregarding traffic or weather conditions. If you have had a slip, trip or fall when on the pavement and suffered an injury, as a result, talk to Legal Expert today. We can help you to claim the compensation you are entitled to on a no win no fee basis. This means that you won’t have to pay any upfront or ongoing fees and will have nothing to pay if you lose your case. If you win, our fee will be included as part of the claim. Contact Legal Expert today and start your compensation for slip trip claim against the council case. You can contact Legal Expert by calling 0800 073 8804 and discussing your case. You can also detail your case in an email to our experts, or use our online chat feature. Find out the average payout for a slip and fall UK claim by talking to us today. Find out more information on the average compensation for slip and fall accidents with our fall compensation calculator. How much compensation can you get for a slip, trip or fall claim? Find out more information with Legal Expert. How much compensation can you claim from the council.